Electronic Arts has announced that an expansion pack for The Sims 3, entitled The Sims 3 World Adventures, will be released worldwide the week of November 16, 2009. Players will be able to take their Sims on new journeys to famous real-world inspired destinations around the globe for the first time ever and seek out new adventures. 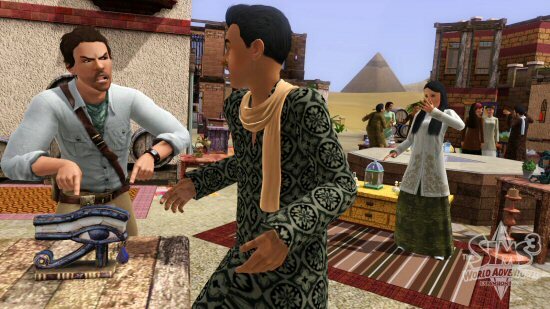 From mastering martial arts in Shang Simla, China, discovering rich culture and famous landmarks on a romantic getaway to Champs Les Sims, France or exploring the depths of ancient tombs in Al Simhara, Egypt, players can take their Sims on a journey that will change their Sims’ lives. Players can accept challenges to search for secret treasures, learn new skills and chase down new personal opportunities, meet new Sims with unique personalities, share their culture and bring them home, discover new styles on their travels, and share everything they encounter on their adventures with the world through personal photographs, movies, and stories. Additionally, players will receive 1,000 SimPoints to be used online in The Sims 3 Store for the PC version of the game. Exclusive online content, available only for the expansion pack at launch, will be revealed soon. Looks like playing The Sims 3 with all the expansion packs is going to get as expensive as The Sims 2.
so soon? Why not fix the bugs first? have you not had the one where no matter what your Sim will not go to work?